The Porirua City centre was a disparate hotchpotch of individual shops with no relation to each other or sympathy to the surrounding environment. To compound matters, the area was very exposed to the elements - and often wind and rain swept. The resulting environment was one that was not enticing shoppers. The Porirua City Council appointed a Wellington architectural firm to rejuvenate the tired area and put some life and soul back into the heart of Porirua. One of the key features of their proposal to the Council was a 'tented street', specifically a 300 metre long stretch of white tensile membrane fabric canopies, manufactured and installed by Structurflex. Designing and installing the largest fabric canopy in New Zealand comes complete with its own unique challenges. As well as being wind and rain swept, Porirua is also on a faultline, and so the tension membrane structure had to comply with some exacting standards. 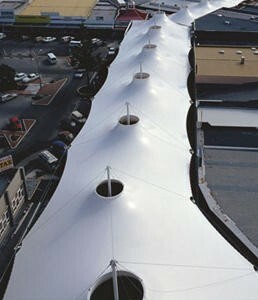 The resulting structure is a very eye catching and effective method of fabric roofing in an open space and a great example of how tensile architecture can be used to solve unique functional requirements, while providing a much-needed facelift to an area. The light-diffusing properties of the membrane combined with transparent cone tops and glass skirts above the shop fronts create a light-filled open-air feel during the day - as if the membrane is simply floating above the covered walkway - yet pedestrians are completely protected from the elements. At night the conical shapes are softly illuminated to striking effect, highlighting the soft white peaks and valleys from afar. The covered walkway area is now not just a buzzing shopping district but a vibrant showcase of local community artwork and a source of pride for Porirua citizens.